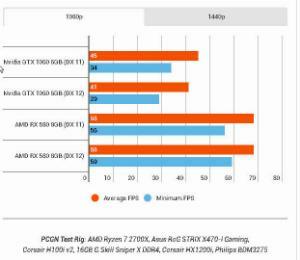 Despite Battlefield V being a full blooded GeForce game, the crew at PCGamesN is reporting that AMD is handily winning the battle for performance so far. They pitted the GTX 1060 up against the RX 580 8GB at both 1080p and 1440p, and the results were surprising, with the RX 580 being around 33% faster. With the GTX 1060 the DX 12 performance is 9% down compared with the card running under the DX 11 API with the exact same system settings. Thatâ€™s not a huge amount, but is still a problem given that there is practically zero difference between DX 12 and DX 11 performance when you throw an RX 580 into the mix. Still, at least the GTX 1080 Ti is still nailing gaming performance - it was delivering a pleasing 114fps at 1080p Ultra settings. Though it too was struggling with DX 12, losing around 14fps on average compared with the DX 11 performance. huldu> Does it even matter? You people just sound like a bunch of fanbois. People buy whatever they want or can afford. It's just simple. I'm not saying AMD is good, they're a pretty terrible company but then again so is Nvidia. Those are the two only options, that pretty much sums up what a dire need of competition there is.